Renowned artist Betty Gold visited Chapman University on April 5 during a documentary screening of her life. Gold is pictured in front of 12 maquettes she donated to the university in 2015. Gold creates large-scale steel sculptures designed for the outdoors. At various times during her career, she has also done photography, tapestries, sculptural jewelry and painted. A former Lone Star Beauty queen, Gold was born in Austin, Texas in 1935. She has lived in Los Angeles since 1977. During her career, Gold’s work has exhibited in fine-art galleries and museums around the world. 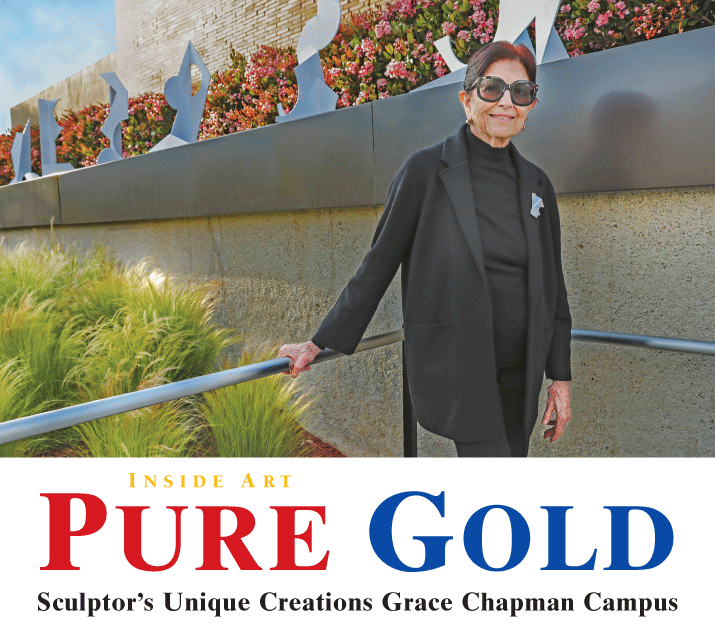 Here in Orange, Gold’s work can be found on the Chapman University campus, where her large folded aluminum “Colgado II” (2013) was commissioned for the south facade of the Hutton Sports Center. 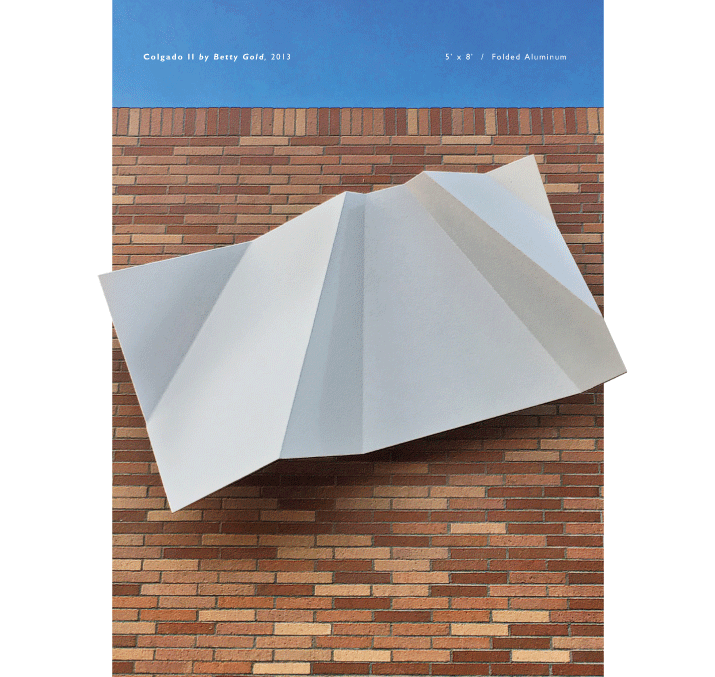 The elegantly angled work of art, pictured on the inside front cover of this issue, is situated so that it catches the California sun all day as varied shadows play across its face. In front of Chapman’s Hutton Center, too, is a collection of a dozen of Gold’s small white metal maquettes (models made for larger sculptures), a gift to the university from the artist. The angular maquettes break up the space and add a jolt of visual interest to the flat planes of the building. They were created in 2015 as models for Gold’s large final sculptures that stand in such locations as Fordham University (Bronx, NY), Boise State University (Boise, Ida. ), the National Museum of Contemporary Art (Seoul, South Korea) and the Biloxi Library and Cultural Center (Biloxi, Miss.). Nearer to Orange, Gold’s sculptures can be found at the Orange County School of the Arts, the Orange County Museum of Art, the Orange County Center for Contemporary Art, the Bowers Museum of Cultural Art, Biola University, UC Irvine, the Ronald Reagan State Building in L.A., the Palm Springs Desert Museum, the Brea Tech Center, USC and Pepperdine University, among others. John Wayne Airport has also acquired a Gold piece. Twice-married and divorced—both times to men who didn’t support her pursuing a career as a metal sculptor—Gold has always forged her own way in a male-dominated field. The documentary film on Gold’s life, “A Year with Betty Gold,” directed by Jason McMerty, had its world premiere last November at the Mallorca International Film Festival in Palma de Mallorca, Spain. This proved a fitting location, since Gold made the city her part-time residence for several years, and the area is home to several of her large-scale sculptures. The film was also screened recently at Chapman University by its director. McMerty, an assistant professor of communications at Elon University and director of the Elon satellite programs in Los Angeles and San Francisco, embedded himself in Gold’s life for 18 months, forging a strong friendship with her as he documented her life and creative activities in her Venice studio. He rented an AirBnB near the studio, watched her working and selling her sculptures, grabbed lunches and dinners with her, walked and talked with her, filming all the while. The editing process took another year. The resulting hour-long film won the Jury Award at the Milwaukee Women’s Film Festival and has garnered acclaim wherever it has screened. “We still hang out and we’re still friends,” says McMerty. Gold is also downsizing. She gave half of her art books to Chapman University Library and the other half to Mary Baldwin University. It’s no longer economically feasible for her to create large steel sculptures, because the price of steel has risen dramatically recently, but she’s still immersed in art. For more information about Betty Gold: www.bettygold.com.